Montgomery Woods State Reserve is a magnificent redwood forest located about 30 minutes from Hwy 101 in Ukiah, Mendocino County. Aside from possibly being the best redwood grove in Northern California its isolated and usually deserted, with the exception of a few people on the weekends. Now isolated is a relative term, sure it's on a little traveled road but it's only 14 (13.8) miles from Ukiah. From N. State St. in Ukiah turn on to Orr Springs Rd. (See interactive map below) This will take you directly to Montgomery Woods. The road is paved and is mostly two lanes but at times it slims down to one. Watch out for the locals as they fly around the blind turns and race down the straight-a-ways. The road winds up the hills toward the Mendocino Coast, on this morning I could look out and see the morning fog retreating back to the ocean. The road then winds down into a canyon and you will pass by the Orr Hot Springs Resort, from here you have about 1.8 miles to go. The parking lot traditionally has been hard to find. Its a gravel lot on the left side of the road (when traveling from Ukiah) and easy to pass by. The State started a project to make some improvements to the Reserve that should be finished 7/30/10. A restroom structure now marks the parking lot, it appears that the parking lot will be paved or at least re-graveled and an informational kiosk is under construction. Until the work is complete the area is only open on the weekends. You can also get here from Hwy 1 on Comptche Ukiah Rd, its a 30 mile drive but expect it to take about 50 min. Once you park and begin your walk to Montgomery Grove you will come to a metal bridge, take an immediate left. The trail is short about 0.5 miles, but steep. Once you crest the hill you will find yourself in one of the most beautiful redwood forests on earth. Uniquely green ferns and clovers carpet the forest floor. A year round creek snakes its way through the forest and under some of the fallen giants, at times diapering under the forest floor completely and reappearing as a bubbling spring. The canopy nearly blocks out the sky. My high-end GPS device had a difficult time maintaining a signal. There are two species of redwoods here, the older Sierra Redwood and the taller Coastal Redwood. At one time the grove was said to have the tallest Redwood in the world at 370 ft. Two others have been found else where making it the 3rd largest but still impressive. The cycle of life is very defined in this ecological paradise. On one side of the canyon you can see evidence of a lightning fire that singed the grove during the 2008 firestorm. The vegetation is making a good recovery. Some people where horrified by the damage the fire caused but keep in mind that is was a natural cause and fire is a part of life in a healthy forest. If you can take your eyes off the giants that dominate the grove you will see redwoods in all stages of life. From young saplings angling for there sliver of sunlight, to the massive trees themselves to the fallen moss covered grandfathers returning to the forest floor. A trail continues on from here it skirts the side of the canyon taking you past rocks with plaques with different dedications to early conservationists of this area. Depending on the time of year the SW side of the canyon may be impassable due to an overflow creek that develops in winter. The trail will lead you to a fallen tree that the Boy Scouts have built a bridge across. The trail winds back toward the start along the opposite canyon wall. The path will lead you to another Boy Scout project, a raised walk way leading around a large moss covered rock and over a marsh of ferns. There you will find one of two log carved benches. 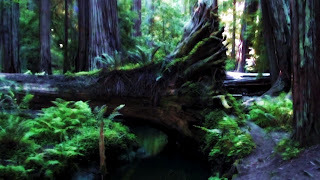 The trail then works its way back to the main cathedral where you first entered this redwood paradise. There are other trails that fork off in different directions, there is even another easy to miss parking area on the opposite side of the street about 0.4 miles back toward Ukiah. I have not hiked these because every time I come here I end up spending all my time in Montgomery Grove. I find the grove to be a very spiritual place and I think no matter what you believe in you will feel it here. So please help keep this special place pristine, please pack out your trash and keep to the path ways. Redwood forest floor is delicate, the roots of the trees run shallow and depend on the soil to be non-compacted. I hope you enjoy Montgomery Woods as much as I do. Please come back and leave a comment below about your experience.